Like many other One Yoga journeys, you have the freedom to decide each day what your agenda will be. Wake up with the sunrise for a day of invigorating yoga and adventure, or sleep in and laze the day away in a beach hammock with the nourishing sun and sound of the surf as your companion. Whatever your style, you can rest assured that you and your practice are welcome here. Our teachers offer classes in a variety of styles that meets all abilities and needs, including Kundalini yoga, slow flow Hatha yoga, yin yoga, gong yoga, and meditation–all with expert guidance and practices personally tailored to the group. At Maya Tulum Resort, you can walk from your cabana straight into the Caribbean Sea for a swim, enjoy delicious and healthy meals that magically show up three times a day, and soak in the prana of this magical shore. If you are feeling adventurous, you can visit the nearby Mayan ruins, snorkel in the cenotes, or enjoy the bright colors and sounds of nature at the nearby bio-reserve. If you are feeling introspective, simply take a yoga class or two, have a massage (or two! ), relax in a hammock, sip on a coconut, and watch the stars illuminate above the waves. If you are fortunate, you might even spot a sea turtle coming up to lay her eggs on the placid beach at night. The resort’s natural thatched-roofed cabanas, steps away from the ocean, blend comfort with nature. Every cabana has a sitting area, tiled bathroom, open shower, and a 5-gallon bottle of filtered water that is refilled as needed. Each cabana also has U.S. outlets to charge your devices and a private safe for your valuables. Part of practicing yoga is nourishing the body with healthy foods, and in this respect, the Maya Tulum Resort shines. Their restaurant serves an all-you-care-to-eat vegetarian and fresh seafood buffet, and these delicious, communal meals are often the highlight of the day. Breakfasts may include fresh local juices, fruits, granola, eggs, potatoes, french toast, yogurt, coffee, and teas. Lunches and dinner may include local specialties, abundant fresh salads, soups, homemade chilaquiles, shrimp ceviche, stuffed avocado, quesadillas, curried rice, fresh local fish, and a dinner dessert that is always anticipated. In between meals, you can always order from the restaurant and enjoy guacamole, fish tacos, fresh juice, or a cold cerveza. 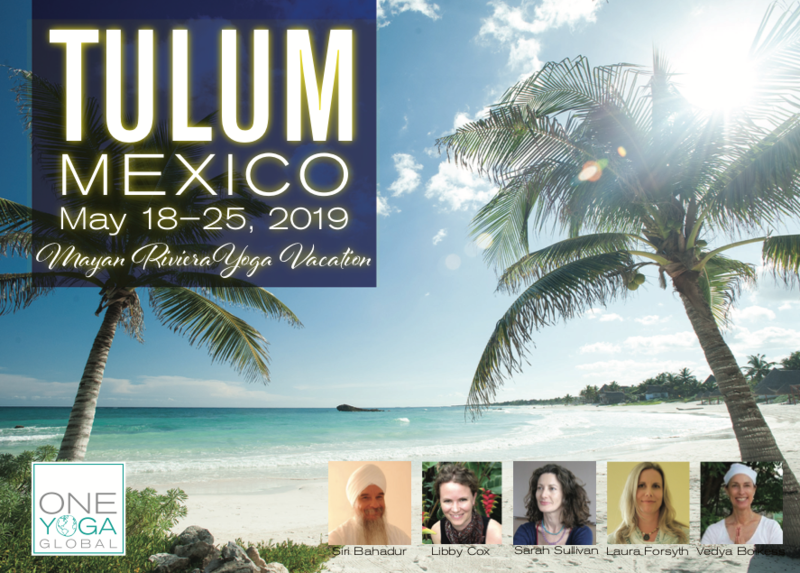 Spa: Maya Tulum offers expert spa treatments and massages with their staff therapists in a number of styles, and many of their their therapists come from a family lineage of Mayan Bodyworkers. Guests report having received some of the best bodywork in their lives at this spa! Excursions: If you’re feeling adventurous, many excursions are available including snorkeling in nearby cenotes, visiting the Tulum ruins on the cliffs, or scuba diving, to name a few. We will coordinate day to day to make sure you have the vacation you desire. Temazcal (Mayan Sweat Lodge): Coordinated with a local Mayan shaman, this sweat lodge experience is an optional opportunity for guests to shed unwanted worries and journey into what’s next.